Shopping for Gary Baseman Pins? Taking inspiration directly from artist Gary Baseman's "The Door is Always Open" exhibition at the Skirball Museum, it's the Gary Baseman Skull and Crossbones Pin! A legendary illustrator, toy designer, pop surrealist, and creator of the Disney cartoon Teacher's Pet, Gary Baseman has given the fun lowbrow pop movement a serious push. 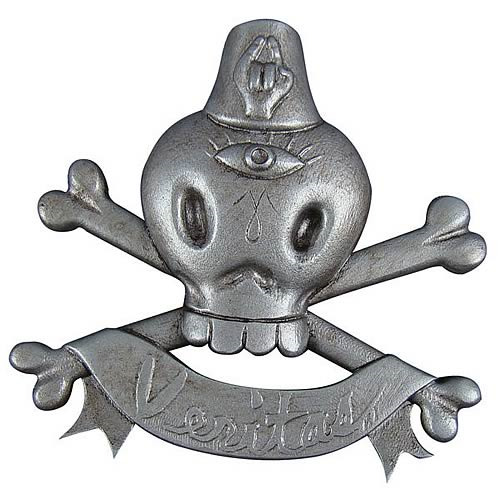 The Skull and Crossbones illustration from his "The Door is Always Open" exhibition is featured on this deluxe sculpted metal Gary Baseman Skull and Crossbones Pin. Underneath the skull it reads, "Veritas," a theme repeated throughout this line of Gary Baseman pins. Measures about 2-inches long.